What was that falling from the sky yesterday? Four weeks since the last real rain and things were getting crunchy dry. 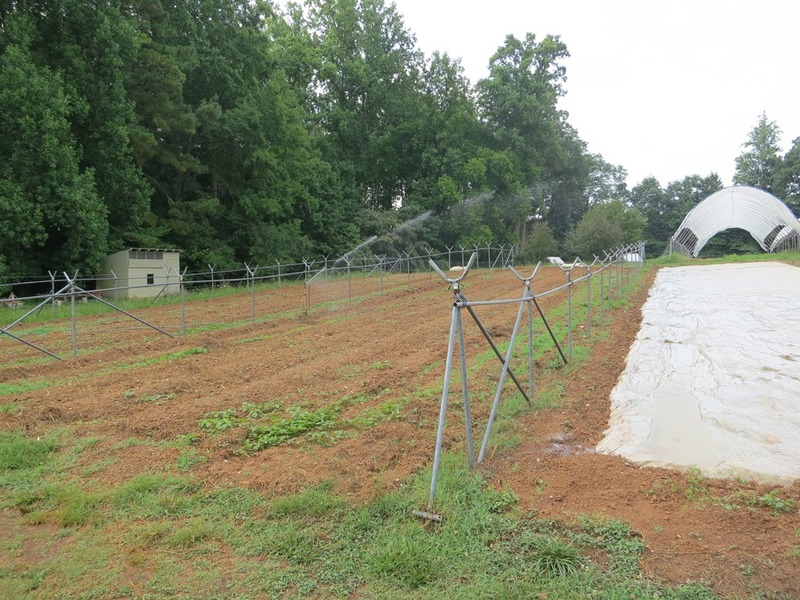 In a determined attempt to make sure that we were able to solarize next year’s tomato field, that has been waiting for a month for a rain so we could cover it with plastic, we ran sprinklers for 48 hours to wet the soil enough to be effective. Must be what finally brought some rain. For solarization to be most effective the soil needs to be good and moist before covering with clear plastic otherwise there is not enough transmission of heat deep into the soil to kill the fungus and weed seeds. As we have whole rows of tomatoes now dying from the fusarium wilt in this year’s field, it is a stark reminder of why we go to the trouble of covering a quarter acre with plastic. After this morning that job will be done. Definitely peak of our tomato season though with the biggest harvest day this last Monday. Just in time for Tomato Day at the market tomorrow and for ACME’s annual tomato festival with three days of a tomato centric menu. You can also find our tomatoes on the menus of Elaine’s on Franklin, Pazzo, GlassHalfull, Oakleaf in Pittsboro and Nana’s in Durham. Time to wade into big plates of tomatoes as they will all too soon be slowing down and then all of a sudden gone until next year. Tomato Day tomorrow, nearly 100 varieties to try, come on down. In reds there are both the balanced Big Beefs and some sweeter Ultrasweets. A huge amount of Cherokee Purples. Some pink German Johnsons, the heirloom of the Piedmont, but they are about done. In yellows we have Orange Blossoms and Kellogg’s Breakfast. A great supply of Striped Germans and Green Cherokees. Cherries galore with the best tasting Sungolds at market, yellow and pink mixed, Black Cherries and a great mix of yellow, red and green Blush types, very sweet. Small amounts of Romas and Italian Oxheart sauce types. No lettuce this week, hopefully back next weekend. Sweet Red Onions. Basil along with Chives. Plenty of Cucumbers. A few more Shishito peppers. Celosia is back! Crazy felt like heads. Plenty of Lisianthus, long lasting mostly in purple this week. Lots of fabulous fragrant Oriental lilies and non-fragrant but deeply colored Asiatic Lilies. Great Sunflowers. More Annabelle Hydrangeas. Still no brilliant Zinnias for another week. Of course beautiful Bouquets.